This variety of basil was chosen as a 2015 All-America Vegetable selection for combining a super-compact plant habit with intense scent and flavor. It recovers its great shape quickly after harvest keeping it looking great in ornamental containers as well as those used strictly for culinary use. Dolce Fresca grows well in beds and herb gardens as well. Keep it evenly watered and pinched. It is slow to flower for an extended harvest time. You will love Basil Dolce Fresca! A new cultivar of the herb lavender is aptly named “Phenomenal”. It is reportedly the hardiest variety ever; tolerating heat and humidity, surviving root and foliar diseases, deer resistant, and hardy in Zones 4 – 8. 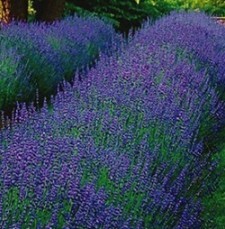 The fragrant, lavender-blue flowers are produced profusely in late spring to early summer on gray-green foliage reaching to around 2 feet tall. 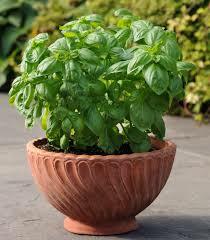 It has many uses including beds, borders, mass plantings and containers and is both culinary and ornamental. We recommend giving this a try! 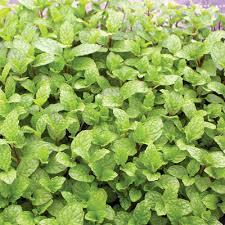 Mint Mojito is a Cuban cultivar named for the popular drink. The leaves may be used fresh or dried in a host of dishes and drinks. It grows 18 to 24 inches and is hardy to Zone 6. 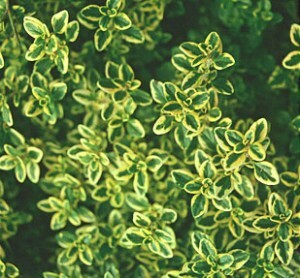 This 12 inch variety of Thyme has green leaves dappled with gold, making it a beautiful addition to any herb or rock garden. It is at its showiest in late winter and spring. The superb lemony fragrance and robust thyme flavor make it great for culinary uses with fish, chicken and marinated, grilled vegetables.